Hello gang. I’ve been curiously quiet on this blog for a little while. I’d like to claim that was because of a lack of time, but in truth, I’ve been thinking about what to say next. And, in truth, one topic kept bobbing up. I wanted to write about what i’ve noticed the differences are between Advertising and PR, as it’s almost been four months in the new gig, which is pretty astonishing. Time’s moving quickly. There is no such thing as a perfect form of communication. We flutter and stutter on the phone, we misplace commas when we write, and get coy face to face. My background’s that of someone who’s spent his whole life in and around the Advertising industry, and to suddenly have that change in the last four months has been a very strange (but very nice) change. Next to Advertising account handlers, PR people do a far, far, FAR greater number of things. There are no creatives here, remember, so they have to be the ones selling in their own ideas to journalists or clients, making sure everything’s on time, on budget and to the required level of creativity that the client expects. And, they have to attend the events which’re put on, which may not sound like a hardship, but you just try maintaining a sense of optimism when you not only have to talk to a client all day, but have to socialise with them in the evenings. The range of skills they are expected to pull off is quite remarkable. There are obvious similarities in some of the roles, and I might venture that the structures are such that there’s a need for different labels at times. I mean, in Advertising (rightly or wrongly), I tend to associate Account Directors with not necessarily being uber-creative, but having a strategic and business mind. In PR, there are aspects of all of these within each AD – though one side is always stronger, because, let’s face it, as human beings, we’re always better at one thing or the other. Now, there’s a need for the debate about the kind of skills a 21st century communications professional has to have. I value specialists, and always will – but the nature of the way PR bills (by the hour and less by the product in the same way an Advertising agency does) means there has to be generalism, by and large. How do you integrate the two, and stop one seeing the other as meaningless fluff that complicates the job? That’s something forward thinking agencies of both discipline will have to wrestle with going forward. One thing’s for certain – it has to be more than *just* a service in order to ensure strategic and creative relevance. To any ad or communications wannabe who’s chanced across this blog, and is wondering whether to go into Advertising or PR, I would honestly say it doesn’t matter. The world may be changing at a ferocious pace, but there’s no ‘right’ way into the two businesseses. You still need to have a sense about how your clients are going to react to a new idea, and how receptive they’ll be to some of the tough conversations you’re inevitably going to have with them about budgets/timings/approaches/who they talk to. The one thing which is absolutely paramount for both disciplines (and indeed, the marketplace in general) is a sense of optimism, tempered by a realistic sense of what’s possible. If you don’t have a sense of ‘making things better’, you absolutely, positively shouldn’t consider either a viable career. I’m not talking about being blindly optimistic that things will get better (because that’s just naivety in another form), but being able to deal with rejection. You have to be empathetic about why a client has said no to your latest ‘game-changing’ idea, and why they doubt some of your attempted positioning statements. There’s also never been more of a need for an agency to act, not just as a service, but as a partner. Being a partner means you need a set of account handling antenna to know when things are about to be ballsed up, and when to talk honestly about the direction you think things going, and how to fix them. Both disciplines can be very good or very bad at that depending on the client relationship – but it’s something which absolutely has to happen regardless of your background. Next to Saatchi & Saatchi, where I work now has been the biggest agency I’ve ever worked in. It has many different departments and moving parts. I still don’t know half the names of people in the building. It’s been an interesting time for me, moving into a world where planning isn’t automatically thought of, as it’s such a new thing. It’s not been around in PR since the 1960s like account planning, so there’s an element of explaining just how and why you can be useful. Clients haven’t met PR planners before, and we need to explain how and why we can fit in. I think it’s bloody helpful to be parachuted into different situations; not to mess with the status quo, but to prevent things becoming too comfortable – it’s too easy for agency people (of both sides, I hasten to add) to get used to the day to day with client x and not challenge it. And this, after all, is why planning was invented; to offer a different point of view. Not – in my opinion – to become as naturalised as it’s become in certain spheres of advertising/marketing, where the planner is nothing more than a sense checker before the work leaves the building. Planning SHOULD be a bit bolshy and difficult, and being a shiny new resource is a good thing, because we can be a force for change. We’re not here to match up with how client x sees the world, and I think that’s always helpful. The wheels tend to come off any agency when they forget themselves, and their overall role; it’s to sell ideas and thinking to clients. This may, or may not involve flogging product. Often (and excitingly) in PR, it’s about shaping CSR strategy, or advising on just what a client is doing in country x and y and how to manage that. There’s a danger when any agency tries to client please too much, and presents too many ideas. Both sides can be guilty of this – the risk it runs is that even if a client loves them all, it looks like the agency hasn’t been able to make its mind up. I understand why Richard harks back to a time when the agency only presented one route, rationalised it, and tried to sell it. The agency was a true partner then, and (though I think presenting one route is sometimes dangerous) had the courage of its convictions. Both industries NEED salesmen/women to help push the business forward. Those people who can bring to life ideas through the force of their will, and borrow from James Webb Young, show a sense of ‘salesmanship’. This doesn’t mean death by PowerPoint, it means considering just what would move that client to a different place, and help them think laterally about a problem. Those people hold the keys to the kingdom, same as ever, regardless of discipline. The biggest change for me has been working in a place where there aren’t ‘creatives’ in the sense there are with Advertising. My favourite part of the job within Advertising was spending time with the creatives and shooting the breeze. To suddenly come somewhere where a lot of ideas are generated through brainstorming (with, as mentioned before, a lot of account handlers/client leads) is a bit strange. However, I will say that i’ve seen just as many good ideas generated quickly in PR as Advertising. It is interesting though, that there’s a lot less navel gazing about the ‘key message’ as there is in Advertising – it’s more about what the story will look like when it eventually comes out. It’s a mindset shift, and a bit of a headfuck for me, as I’ve never worried or thought about this sort of thing. BBH used to say ‘how can we make this idea famous’, and moving to this (arguably more PR centric) conversational approach is, I think, the right thing. Craftsmen will always be important, but thinking about the story and working backwards is a bloody useful approach when it comes to proposing the idea – and one both disciplines should always bear in mind when generating ideas. So there we are. 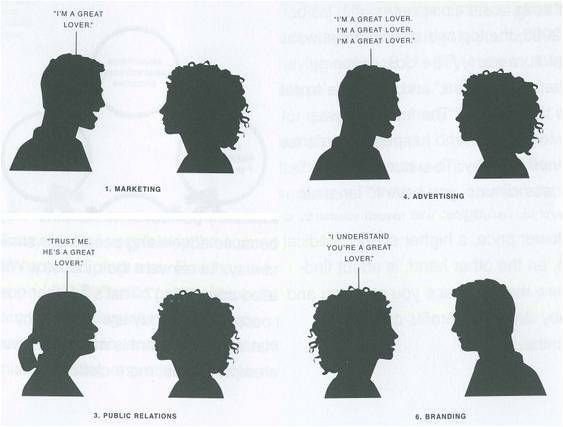 Five musings on the differences between Advertising and PR. Add your own. I’d love to hear ’em.